Geniuses, all: Gretchen Weerheim, moi, Chris Clemetson. Just because I have a few books out there with a Big Five publisher that doesn’t make me a somebody. (Okay, maybe it at least qualifies me for Amateur Plus status.) But once in a while I do get out in the World for a chance to mingle with the famous and near-famous, and that can only up my cred. 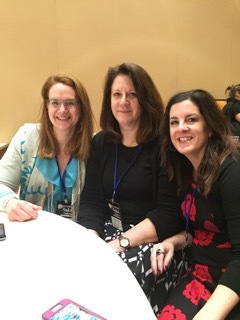 Last weekend I was at the seventh annual Liberty States Fiction Writers Conference in Iselin, here in my home state of New Jersey. 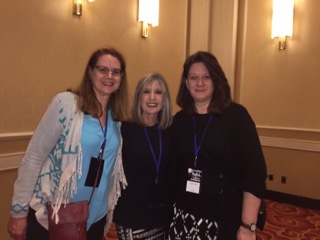 It’s a fun event, with workshops and panels and editor/agent appointments, speakers like Hank Phillippi Ryan. 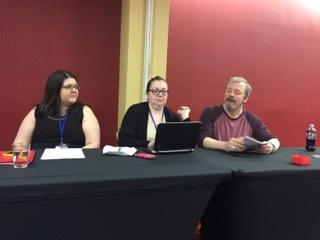 I even got to attend a wicked Mad Libs session given by Kate McMurray, Tere Michaels and Damon Suede. And who knows, maybe I even learned something. Previous PostWriters AnonymousNext PostGet Your Geek on NJ!